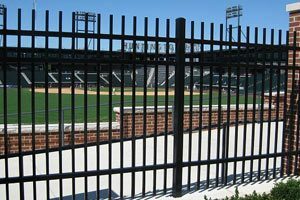 Ameristar offers several fencing product lines that provide outstanding protection for a wide range of properties. All models are constructed of welded steel and coated with Ameristar’s exclusive powder coatings over galvanized steel. Offering attractive appearance while presenting barrier protection for properties, there’s a model and style that is suitable for almost any situation where security is a high priority. Each product line also includes gates with the matching designs that are compatible with automatic gate openers. Our company can supply any Ameristar product, and will be happy to discuss your requirements and help you create a complete materials list for any installation. Our direct shipping from the manufacturer and discounted pricing mean fast delivery and great value. Remarkable strength and an imposing profile make Impasse II fencing a popular choice for a wide range of applications. Heavy posts and closely spaced vertical pales present a potential intruder with a daunting challenge. Rails are designed to provide a race for intrusion detection systems, video monitoring and gage operating systems. Impasse II fences are CFATS compliant for use at chemical factories and storage facilities. Available in black, bronze, white and tan finishes, and in heights to 10 feet, these systems are available in several styles, all with a 15-year warranty. Stronghold Style – Rounded picket tops for public safety where required. Trident Style – Triple-pointed picket tops provide a strong visual climbing deterrent. Gauntlet Style – Outwardly curved pales with the trident pointed top for maximum deterrence. Impasse II Anti-Scale – Closely spaced pales prevent climbing. Available in all three styles. 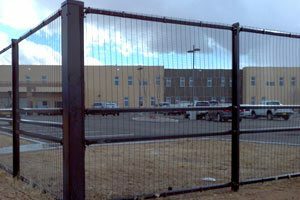 This unique security fence system utilizes welded wire mesh filler panels to provide outstanding visual transparency while ensuring security. The tight mesh pattern prevents climbing and keeps cutting tools from functioning within the mesh. Rails are designed to serve as wiring races, as in other Ameristar model lines. 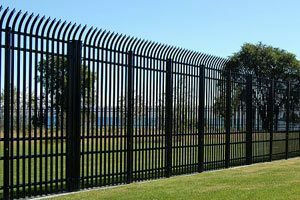 The excellent visibility through the fence and its anti-climbing properties make it ideal for applications such as petroleum and chemical facilities, power plants and substations, military sites, airports, transportation routes and roadways. 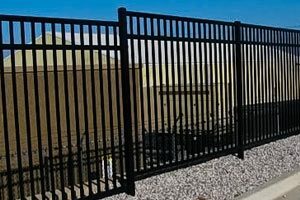 As Ameristar’s most popular industrial and security fence lines, Montage II fences combine an ornamental appearance while providing excellent security features. Heavy duty pales, posts and rails are fusion welded, with Ameristar’s E-coat finish that offers a 20-year warranty. Available in black or bronze, and in heights to 8 feet, the pales pass through the rails for additional strength and simplicity of installation. Two, three, and four-rail models are available. Matching gates in all styles include distinctive arched gates. Panels are easily racked for installation on uneven terrain. Beauty and security are combined in all available styles. Classic Style – Spear-pointed pale tops provide climbing deterrence. Majestic Style – A smooth top rail encloses pale tops for safety. Genesis Style – Squared-off picket tops have the look of traditional wrought iron. Invincible Style – Outwardly curved spear-point picket tops offer maximum deterrence. Classic Style – Pickets terminate in a classic spear point. Majestic Style – Where safety is a priority, the enclosed top rail is a plus. Genesis Style – Classic squared pale tops present a wrought iron appearance. Invincible Style – Outwardly curved spear-point pales strongly discourage climbing. Incorporating Ameristar’s renowned anti-ram cabling system, the Stalwart series provides maximum security that protects against intruders who use vehicles to ram the fence to gain access to the protected property. Stalwart II and Stalwart IS designs are traditional picket and rail fences that include anti-ramming cables in their rails. Various levels of anti-ram protection are available as options. Stalwart Post and Rail fences are designed to be placed outside of other fences to provide protection against ramming. Stalwart models are DHS SAFETY ACT certified. Available in all standard heights, they include rails designed to act as races for security system elements. Matching swing gates are available for all styles. Stalwart IS Gauntlet Style – Outwardly curved triple-pointed pales deter climbing. Stalwart IS Stronghold Style – Blunt, rounded pales ensure public safety. Stalwart IS Trident Style – Triple-pointed picket tops present an imposing barrier. Stalwart II Majestic Style – Pickets are enclosed in the top rail for maximum safety. Stalwart II Genesis Style – Traditional flat picket tops can be enhanced with optional finials. Stalwart II Invincible Style – Spear-pointed picket tops curve outward to inhibit climbing. Stalwart Post and Rail – Traditional post and rail design for anti-ramming use. 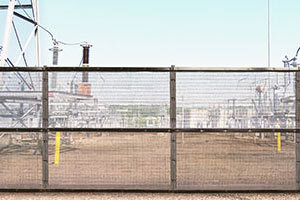 For electric power facilities and substations, where maximum security fencing is an absolute requirement, consider the Ameristar Matrix system for the utmost in protection against terrorism threats and other maximum security needs. This engineered grid wall is flexible, cost-effective, and installs quickly. It can be configured to match any strict standard set by the Department of Homeland Security and other regulators. By specifying advanced Stalwart options, you can upgrade your Matrix grid panel security fence system to withstand ramming by vehicles. Matrix enclosures also effectively deter cutting, prying, and climbing by any intruders seeking entry to the facility and can prevent visual access to your facility. Matrix designs are also recommended for many other high-risk facilities and installations, including remote natural gas and LPG compressor and distribution stations. The framework is designed to accept and protect wiring and cables for intrusion detection systems and video monitoring systems, adding additional capabilities to your security measures. No two properties are the same. 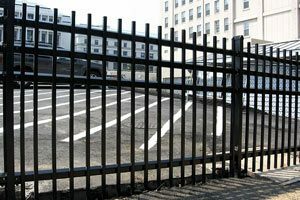 When you need high security steel fencing to protect your property, you have a wide range of options available from Ameristar, the leading US manufacturer of commercial and industrial security products. Contact our specialists to discuss your installation requirements. We’ll help you choose an ideal solution and assist you in creating a complete materials list for your project. With our high-volume purchasing and direct shipping from the manufacturer, we’re your ideal source for security fencing for your perimeter and other enclosure needs. We can supply you with any Ameristar product line, along with the expertise you need to make the right choices.